Experiencing fear or anxiety at the thoughts of going to your Scotts Valley dentist are common thoughts among many patients. Becoming anxious the moment you walk in through the doors can set off fear and anxiety that seems to creep up out of nowhere. These feelings may even prevent you from seeing the dentist regularly for checkups and cleanings, only going in when you experience an oral health problem such as pain or a toothache. Now, revolutionary NuCalm can offer you a relaxed experience at the dentist without medication! Traditional methods of sedation dentistry involve either using medication (pill form) or nitrous oxide known as laughing gas. While these methods are safe and effective, they are not exactly natural, and may not be a good fit for everyone due to health restrictions. Now, with NuCalm, you can undergo your dental treatments while feeling completely calm and relaxed, all thanks to this revolutionary, all-natural method. Ebrahimian Integrative Dentistry is excited to offer NuCalm to their patients. 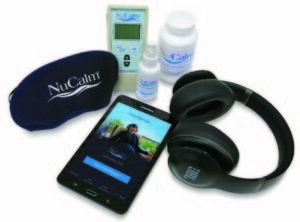 NuCalm allows you to receive dental treatments while feeling relaxed. NuCalm is unique in that it mimics the same communication process our bodies use when we are getting ready to go to sleep by preparing the mind for relaxation. Once administered, it takes only minutes to feel its effects. The best part is that by the time your appointment is over, you can leave the office and resume your normal activities or return to work. No need to rely on someone to drive you to and from your appointment or worry with the hassle of resting the remainder of the day. Step 1: To begin, your Scotts Valley dentist will give you a topical cream that contains an all-natural stress interrupter. This supplement is safe to take even if you are taking other prescription medications, vitamins or supplements. Plus, it does not require any dietary restrictions. Within minutes, you will begin to feel its effects. Step 2: Next, we apply microcurrent stimulation by placing patches behind your ears. This process helps to deepen your state of relaxation. Step 3: Noise-cancelling headphones that play proprietary neuroacoustic software are worn to bring brain waves to pre-sleep stages. Step 4: The final step in your relaxation experience is to place a light-blocking eye mask over your eyes, which inhibits the potential for visual stimuli. NuCalm has significant benefits as opposed to traditional sedation dentistry options. No recovery – Since NuCalm is completely natural, it does not involve any sort of recovery time afterward. You can be well on your way immediately following your procedure. Stress-free dental treatments – With NuCalm, you can undergo anything from a dental cleaning to extensive procedures feeling completely relaxed and calm. Rejuvenate at the dentist – You probably never thought you could have a spa-like experience at the dentist, but you can with NuCalm! Many patients report feeling refreshed and rejuvenated afterward. Studies have proven that NuCalm is safe for most patients, including children. It is important, however, that you disclose your complete health history with your dentist prior to undergoing any treatment involving NuCalm. If you fall under one of these categories mentioned above, it does not necessarily preclude you from the NuCalm experience entirely; certain components may need to be skipped. However, your dentist will be sure to take special care throughout your procedure to ensure you feel comfortable and relaxed the entire time. To learn more about NuCalm or other methods of sedation dentistry in Scotts Valley, contact Ebrahimian Integrative Dentistry by calling (831) 438-4411 and schedule a consultation. Ebrahimian Integrative Dentistry provides total oral health care for patients located in the California communities of Los Gatos, Santa Cruz, and Scotts Valley.